"Ilkhan" redirects here. For other uses, see Ilkhan (disambiguation). The Ilkhanate, also spelled Il-khanate (Persian: ایلخانان‎, Ilxānān; Mongolian: Хүлэгийн улс, Hu’legīn Uls), was established as a khanate that formed the southwestern sector of the Mongol Empire, ruled by the Mongol House of Hulagu. It was founded in the 13th century and was based primarily in Iran as well as neighboring territories, such as present-day Azerbaijan and the central and eastern parts of present-day Turkey. The Ilkhanate was originally based on the campaigns of Genghis Khan in the Khwarazmian Empire in 1219–24 and was founded by Hulagu Khan, son of Tolui and grandson of Genghis Khan. With the fragmentation of the Mongol Empire after 1259 it became a functionally separate khanate. At its greatest extent, the state expanded into territories that today comprise most of Iran, Iraq, Armenia, Azerbaijan, Georgia, Turkmenistan, Turkey, western Afghanistan, and the Northwestern edge of the Indian sub-continent. Later Ilkhanate rulers, beginning with Ghazan in 1295, converted to Islam. According to the historian Rashid-al-Din Hamadani, Kublai Khan granted Hulagu (Hülegü) the title of Ilkhan after his defeat of Ariq Böke. The term ilkhan here means " khan of the tribe, khan of the 'ulus'" and this inferior "khanship" refers to the initial deference to Möngke Khan and his successor Great Khans of the Mongol empire. The title "Ilkhan", borne by the descendants of Hulagu and later other Borjigin princes in Persia, does not materialize in the sources until after 1260. When Muhammad II of Khwarezm executed a contingent of merchants dispatched by the Mongols, Genghis Khan declared war on the Khwārazm-Shāh dynasty in 1219. The Mongols overran the empire, occupying the major cities and population centers between 1219 and 1221. Persian Iran was ravaged by the Mongol detachment under Jebe and Subedei, who left the area in ruin. Transoxiana also came under Mongol control after the invasion. The undivided area west of the Transoxiana was the inheritance of Genghis Khan's Borjigin family. Thus, the families of the latter's four sons appointed their officials under the Great Khan's governors, Chin-Temür, Nussal, and Korguz, in that region. Muhammad's son Jalal ad-Din Mingburnu returned to Iran in c. 1224 after his exile in India. The rival Turkic states, which were all that remained of his father's empire, quickly declared their allegiance to Jalal. He repulsed the first Mongol attempt to take Central Persia. However, Jalal ad-Din was overwhelmed and crushed by Chormaqan's army sent by the Great Khan Ögedei in 1231. During the Mongol expedition, Azerbaijan and the southern Persian dynasties in Fars and Kerman voluntarily submitted to the Mongols and agreed to pay tribute. To the west, Hamadan and the rest of Persia was secured by Chormaqan. The Mongols invaded Armenia and Georgia in 1234 or 1236, completing the conquest of the Kingdom of Georgia in 1238. They began to attack the western parts of Greater Armenia, which was under the Seljuks, the following year. In 1236 Ögedei was commanded to raise up Khorassan and proceeded to populate Herat. The Mongol military governors mostly made camp in the Mughan plain in what is now Azerbaijan. Realizing the danger posed by the Mongols, the rulers of Mosul and Cilician Armenia submitted to the Great Khan. Chormaqan divided the Transcaucasia region into three districts based on the Mongol military hierarchy. In Georgia, the population was temporarily divided into eight tumens. By 1237 the Mongol Empire had subjugated most of Persia (including modern-day Azerbaijan), Armenia, Georgia (excluding Abbasid Iraq and Ismaili strongholds), as well as all of Afghanistan and Kashmir. After the battle of Köse Dağ in 1243, the Mongols under Baiju occupied Anatolia, while the Seljuk Sultanate of Rûm and the Empire of Trebizond became vassals of the Mongols. Güyük Khan abolished decrees issued by the Mongol princes that had ordered the raising of revenue from districts in Persia as well as offering tax exemptions to others in c. 1244. In accordance with a complaint by the governor Arghun the Elder (Arghun agha), Möngke Khan prohibited ortog-merchants and nobles from abusing relay stations and civilians in 1251. He ordered a new census and decreed that each man in the Mongol-ruled Middle East must pay in proportion to his property. Persia was divided between four districts under Arghun. Möngke Khan granted the Kartids authority over Herat, Jam, Pushang (Fushanj), Ghor, Khaysar, Firuz-Kuh, Gharjistan, Farah, Sistan, Kabul, Tirah, and Afghanistan. The founder of the Ilkhanate dynasty was Hulagu Khan, grandson of Genghis Khan and brother of both Möngke Khan and Kublai Khan. Möngke dispatched Hulagu to establish a firm Toluid control over the Middle East and ordered him return to Mongolia when his task was accomplished. Taking over from Baiju in 1255 or 1256, Hulagu had been charged with subduing the Muslim kingdoms to the west "as far as the borders of Egypt". This occupation led the Turkmens to move west into Anatolia to escape from the Mongolian rule. He established his dynasty over the southwestern part of the Mongol Empire that stretched from Transoxiana to Syria. He destroyed the Ismaili Nizari Hashshashins and the Abbasid Caliphate in 1256 and 1258 respectively. After that he advanced as far as Gaza, briefly conquering Ayyubid Syria. 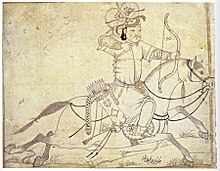 A Mongol horse archer in the 13th century. The death of Möngke forced Hulagu to return from the Persian heartland for the preparation of Khurultai (the selection of a new leader). He left a small force behind to continue the Mongol advance, but it was halted in Palestine in 1260 by a major defeat at the battle of Ain Jalut at the hands of the Mamluks of Egypt. Due to geo-political and religious issues and deaths of three Jochid princes in Hulagu's service, Berke declared open war on Hulagu in 1262 and possibly called his troops back to Iran. According to Mamluk historians, Hulagu might have massacred Berke's troops and refused to share his war booty with Berke. Hulagu's descendants ruled Persia for the next eighty years, tolerating multiple religions, including Shamanism, Buddhism, and Christianity, and ultimately adopting Islam as a state religion in 1295. However, despite this conversion, the Ilkhans remained opposed to the Mamluks, who had defeated both Mongol invaders and Crusaders. The Ilkhans launched several invasions of Syria, but were never able to gain and keep significant ground against the Mamluks, eventually being forced to give up their plans to conquer Syria, along with their stranglehold over their vassals the Sultanate of Rum and the Armenian kingdom in Cilicia. This was in large part due to civil war in the Mongol Empire and the hostility of the khanates to the north and east. The Chagatai Khanate in Moghulistan and the Golden Horde threatened the Ilkhanate in the Caucasus and Transoxiana, preventing expansion westward. Even under Hulagu's reign, the Ilkhanate was engaged in open warfare in the Caucasus with the Mongols in the Russian steppes. On the other hand, the China-based Yuan Dynasty was an ally of the Ikhanate and also held nominal suzerainty over the latter (the Emperor being also Great Khan) for many decades. Hulagu took with him many Chinese scholars and astronomers, and the famous Persian astronomer Nasir al-Din al-Tusi learned about the mode of the Chinese calculating tables from them. The observatory was built on a hill of Maragheh. The dragon clothing of Imperial China was used by the Ilkhanids, the Chinese Huangdi (Emperor) title was used by the Ilkhanids due to heavy clout upon the Mongols of the Chinese system of politics. Seals with Chinese characters were created by the Ilkhanids themselves besides the seals they received from the Yuan dynasty which contain references to a Chinese government organization. The courts of Western Europe made many attempts to form an alliance with the Mongols, primarily with the Ilkhanate, in the 13th and 14th centuries, starting from around the time of the Seventh Crusade (West Europeans were collectively called Franks by Muslims and Asians in the era of the Crusades). United in their opposition to the Muslims (primarily the Mamluks), the Ilkhanate and the Europeans were nevertheless unable to satisfactorily combine their forces against their common enemy. In the immediate period following Hulagu, the Ilkhan elite increasingly adopted Tibetan Buddhism, in contrast to the Golden Horde and Chagatai Khanate which had already been drifting towards Islam before the Ilkhanate's conquests, leading to the khans Berke and Mubarak Shah, respectively. Christian powers were encouraged by what appeared to be an inclination towards Nestorian Christianity by Ilkhanate rulers, but this was probably nothing more than the Mongols' traditional even-handedness towards competing religions. The Ilkhans were thus markedly out of step with the Muslims they ruled. Ghazan, shortly before he overthrew Baydu, converted to Islam under influence of Nawrūz, and his official favoring of Islam as a state religion coincided with a marked attempt to bring the regime closer to the non-Mongol majority of the regions they ruled. Christian and Jewish subjects lost their equal status and again had to pay the jizya protection tax. Ghazan gave Buddhists the starker choice of conversion or expulsion and ordered their temples to be destroyed; though he later relaxed this severity. Tekuder was the first Ilkhanid ruler to embrace Islam. Although he didn't declare Islam as the state religion, he attempted to replace Mongol political traditions with Islamic ones, resulting in a loss of support from the army and being overthrown. Ghazan on the other hand attempted to syntheize both political thoughts. He had been assisted in the seizure of the throne by Nowruz. After his installation, he reportedly endorsed religious persecution of Christians, Jews, Zoroastrians and Buddhists. Nowruz was however deposed and killed in 1297. This resulted in a marked shift of Ghazan's policies, with punishment for religious intolerance and attempts to restore relations with non-Muslims. 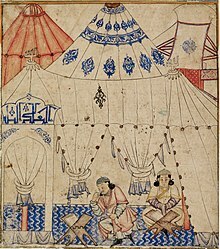 The Mongol ruler, Ghazan, studying the Qur'an. In foreign relations, the Ilkhanate's conversion to Islam had little to no effect on its hostility towards other Muslim states, and Ghazan continued to fight the Mamluks for control of Syria. The Battle of Wadi al-Khazandar, the only major victory by the Mongols over the Mamluks, ended the latter's control over Syria, though this lasted only a few months. For the most part, Ghazan's policies continued under his brother Öljeitü despite suggestions that he might begin to favor the Shi'a brand of Islam after he came under the influence of Shi'a theologians Al-Hilli and Maitham Al Bahrani. Öljeitü who had been baptised as an infant, had flirted with Buddhism, became a Hanafi Sunni, though there seems to have been some residual shamanism seems to have. In 1309-10, he became a Shi'ite Muslim. An Armenian scribe in 1304 noted the death of "benevolent and just" Ghazan, who was succeeded by Khar-Banda Öljeitü "who too, exhibits good will to everyone." A colophon from 1306 reports conversion of Mongols to Islam and "they coerce everyone into converting to their vain and false hope. They persecute, they molest, and torment," including "insulting the cross and the church". Some of the Buddhists who survived Ghazan's assaults, made an unsuccessful attempt to bring Öljeitü back into Dharma, showing they were active in the realm for more than 50 years. The conversion of Mongols was initially a fairly superficial affair. The process of establishment of Islam did not happen suddenly. Öljeitü's historian Qāshāni records that Qutlugh-Shah after losing patience with a dispute between Hanafis and Shafi'is, expressed his view that Islam should be abandoned and Mongols should return to the ways of Genghis Khan. Qāshani also stated that Öljeitü had in fact reverted for a brief period. As Muslims, Mongols showed a marked preference for Sufism with masters like Safi-ad-din Ardabili often treated with respect and favour. In the 1330s, outbreaks of the Black Death ravaged the Ilkhanate empire. The last il-khan Abu Sa'id and his sons were killed by the plague. In 1330, the annexation of Abkhazia resulted in the reunification of the Kingdom of Georgia. However, tribute received by the Il-Khans from Georgia sank by about three-quarters between 1336 and 1350 because of wars and famines. Also Anatolian Beyliks were freed from Ilkhanate suzerenaity. After Abu Sa'id's death in 1335, the Ilkhanate began to disintegrate rapidly and split up into several rival successor states, most prominently the Jalayirids. Hasar's descendant Togha Temür, who was the last of the obscure Ilkhan pretenders, was assassinated by Sarbadars in 1353. Timur later carved a state from the Jalayirids, ostensibly to restore the old khanate. Historian Rashid-al-Din Hamadani wrote a universal history of the khans around 1315 that provides much material about them. In 1357, the Golden Horde conquered the Chobanid-held Tabriz for a year, putting an end to the last hope for the return of the Ilkhanate. After the demise of the Ilkhanate, the Armenian Kingdom of Cilicia lost Mongol protection against the Mamluks and was destroyed by them in 1375. Southwest Asia in 1345, ten years after the death of Abu Sa'id. The Jalayirids, Chobanids, Muzaffarids, Injuids, Sarbadars, and Kartids took the Ilkhanate's place as the major powers in Iran. The emergence of the Ilkhanate had an important historical impact in the Middle Eastern region. The establishment of the unified Mongol Empire had significantly eased trade and commerce across Asia. The communications between the Ilkhanate and the Yuan Dynasty headquartered in China encouraged this development. The Ilkhanate also helped to pave the way for the later Safavid dynastic state, and ultimately the modern country of Iran. Hulagu's conquests had also opened Iran to Chinese influence from the east. This, combined with patronage from his successors, would develop Iran's distinctive excellence in architecture. Under the Ilkhans, Iranian historians also moved from writing in Arabic to writing in their native Persian tongue. The rudiments of double-entry accounting were practiced in the Ilkhanate; merdiban was then adopted by the Ottoman Empire. These developments were independent from the accounting practices used in Europe. This accounting system was adopted primarily as the result of socio-economic necessities created by the agricultural and fiscal reforms of Ghazan Khan in 1295-1304. Ilkhanate, Lampas with phoenix, silk and gold, Iran or Iraq, 14th century. Ilkhanate, Lampas textile, silk and gold; second half of 14th century. 1305 letter of the Ilkhan Mongol Öljaitü (official square red stamp of the Ilkhanate). After the Ilkhanate, the regional states established during the disintegration of the Ilkhanate raised their own candidates as claimants. Sarbadars, the famous political movement of the Ilkhanid era of Persia. ^ a b Komaroff 2013, p. 78. ^ Badiee 1984, p. 97. ^ Turchin, Peter; Adams, Jonathan M.; Hall, Thomas D (December 2006). "East-West Orientation of Historical Empires". Journal of World-systems Research. 12 (2): 223. ISSN 1076-156X. Retrieved 13 September 2016. ^ Rein Taagepera (September 1997). "Expansion and Contraction Patterns of Large Polities: Context for Russia". International Studies Quarterly. 41 (3): 496. doi:10.1111/0020-8833.00053. JSTOR 2600793. ^ Central Asiatic Journal. O. Harrassowitz. 2008. p. 46. ^ "Despite numerous envoys and the obvious logic of an alliance against mutual enemies, the papacy and the Crusaders never achieved the often-proposed alliance against Islam". Atwood, Encyclopedia of Mongolia and the Mongol Empire, p. 583, "Western Europe and the Mongol Empire"
^ David Morgan (2015-06-26). Medieval Persia 1040–1797. p. 64. ISBN 9781317415671. ^ David Morgan (2015-06-26). Medieval Persia 1040–1797. p. 72. ISBN 9781317415671. ^ Timothy May (2016). The Mongol Empire: A Historical Encyclopedia - Volume I. ABC-CLIO. p. 141. ISBN 9781610693400. ^ Angus Donal Stewart (2001-01-01). The Armenian Kingdom and the Mamluks: War and Diplomacy During the Reigns of Het'um II (1289-1307). Brill. p. 182. ISBN 978-9004122925. ^ Angus Donal Stewart (2001-01-01). The Armenian Kingdom and the Mamluks: War and Diplomacy During the Reigns of Het'um II (1289-1307). Brill. p. 181. ISBN 978-9004122925. ^ Johan Elverskog (2011-06-06). Buddhism and Islam on the Silk Road. Harvard University Press. p. 141. ISBN 978-0812205312. ^ David Morgan (2015-06-26). Medieval Persia 1040–1797. p. 73. ISBN 9781317415671. Atwood, Christopher P. (2004). The Encyclopedia of Mongolia and the Mongol Empire. Facts on File, Inc. ISBN 0-8160-4671-9. C.E. Bosworth, The New Islamic Dynasties, New York, 1996. Kadoi, Yuka. (2009) Islamic Chinoiserie: The Art of Mongol Iran, Edinburgh Studies in Islamic Art, Edinburgh. ISBN 9780748635825. R. Amitai-Preiss: Mongols and Mamluks: The Mamluk-Ilkhanid War 1260–1281. Cambridge, 1995. Badiee, Julie (1984). "The Sarre Qazwīnī: An Early Aq Qoyunlu Manuscript?". Ars Orientalis. University of Michigan. 14. Komaroff, Linda, ed. (2013). Beyond the Legacy of Genghis Khan. Brill. Wikimedia Commons has media related to Ilkhanate. Encyclopedia Iranica. Contains more information on the Ilkhanate.